Unseen Films: The awesome Mad Tiger hits theaters Friday and is a must see. The awesome Mad Tiger hits theaters Friday and is a must see. One of the highlights of last years DOC NYC was MAD TIGER about the changing of the guard in the band Peelander Z. I wrote a short piece about the film because I couldn't say a great deal about the film because its just so damn good that the film says it all. Its one of those films that short of dragging you to see there is nothing I can do to make you like the film any more than what the film does so magnificently. The film opens Friday and is an absolute must see for anyone looking for a truly great film. Here is my DOC NYC piece. 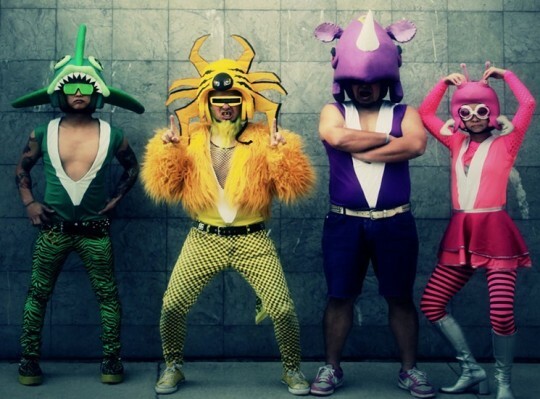 Strangely moving look at the band Peelander-Z, a Japanese punk band based in New York that puts on wild shows. As the film begins one of the band members, Red decides to leave the band for something more secure and with a future. This upsets the groups leader, Yellow, who must work to maintain the friendship and try to figure out where he is heading himself. Fantastic portrait of a band and it's leader that works on so many different levels. What I love about the film is that what starts out with a look at a band changes into a look at what it takes to be in a band and how the relationships outside of the band are forced to change because of the dynamics of the band. Whats even better that as the film goes on it morphs again and becomes Kengo's quest to find himself...or maybe that's what it was about all along. Either way, or anyway it's amazing. Its so good I can't wait to see it again.